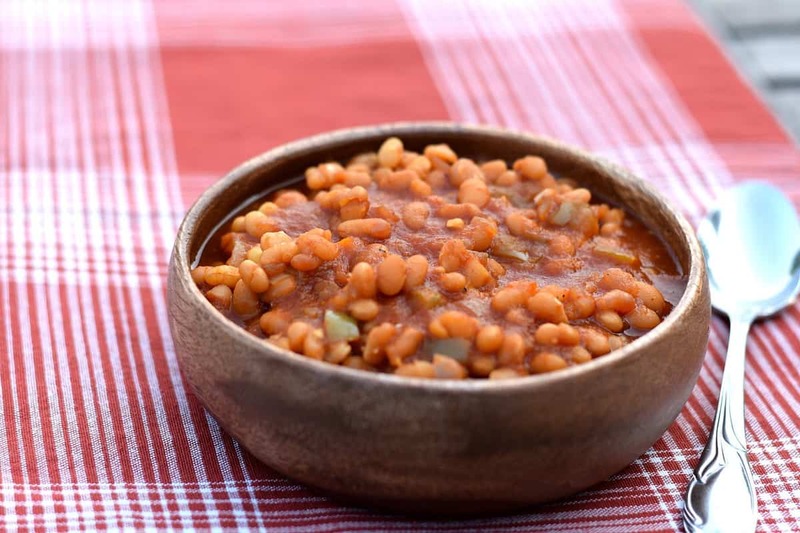 One of my most popular recipes to date, is this recipe for Best Dang BBQ Vegan Baked Beans. I first published it in May of 2015, and it has practically stayed in my top 10 list ever since – no matter the season. This is one of those recipes grandma or mom might have used, as the beans were slow cooked on the stove for hours to get that authentic, homemade taste. And it definitely shows! But I knew it was only a matter of time before someone asked for this recipe to get converted for the Instant Pot Pressure Cooker. And since I have a potluck to go to this weekend…… here you go. They still take a bit of time, so give yourself a few hours when you decide to make these….but they are SO worth it. They taste 100x better than anything you could ever get out of a can. And there’s absolutely no worry of any weird chemicals, BPA lined cans, added oils, or HFCS when you make them yourself. Take a 1lb bag of Navy Beans, and spread them out in a bowl or pan. We just want to pick through them and remove any weird colored beans, rocks, or basically anything else that doesn’t belong. Now toss them into a large pan and cover them with 2-3″ of cold water. Stir in 1 Tbs of Kosher Salt and bring that to a boil. Once they begin to boil, allow them to cook for 1 minute, then remove them from the heat, cover them with a lid, and let them sit for at least 1 hr. This is called the Quick Soak Procedure and saves you the time of soaking them overnight. After the hour is up, sauté 1 medium-sized, diced white onion in a few tablespoons of veg broth (or water), directly in your IP, using the SAUTE mode. Make sure the Sauté Power setting is on LESS. Stir in a diced Green Bell Pepper and about a teaspoon of chopped Jalapeño (optional but good). While the veggies are softening, drain the other pot of beans and rinse them well. Again, pick out anything that doesn’t belong. Onne the veggies have softened, stir in the garlic, turn OFF the IP and stir in the beans and 2 cups of water. Whisk the sauce until smooth and then pour into the beans and mix well. Attach the lid ensuring the vent valve is set to SEALING and then press MANUAL, HIGH PRESSURE, and set the time for 45 minutes. Once the time has passed, allow the IP to naturally vent for 15 minutes, and then you can (carefully) release any remaining steam manually. If at this point the beans still have a lot of liquid, you can turn the IP back on to SAUTE mode and allow the beans to continue cooking until they reach your desired consistency. Taste and adjust any seasonings if necessary. 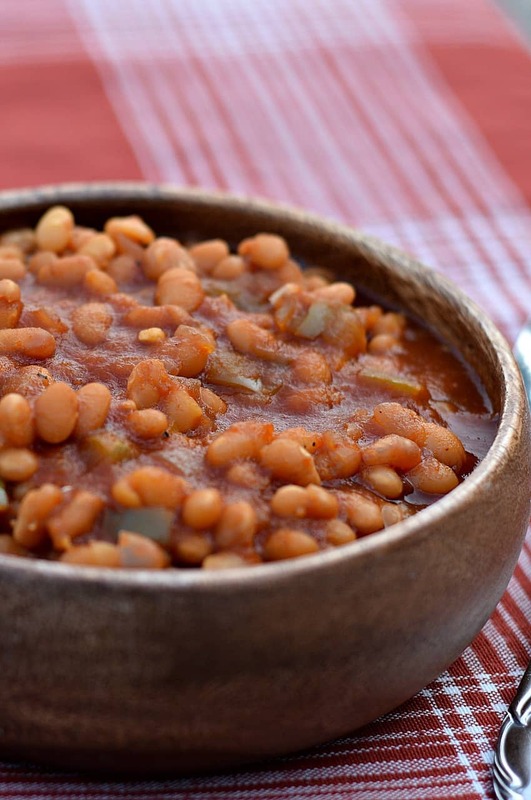 These Vegan Baked Beans will surely be a ht at your next BBQ. That old fashioned baked bean taste - without hours of simmering on the stove, thanks to the Instant Pot Pressure Cooker. Pick through the beans, removing any debris, and then add them to a large pot. Cover with 2-3" of water and stir in salt. Bring to a boil. Boil beans for 1 minute, then remove from heat and cover. Allow to soak for at least 1 hour. After an hour has passed, drain and rinse beans thoroughly. Saute the diced onion, bell pepper, and jalapeño directly in your IP, on SAUTE mode, LESS power, until softened. Stir in minced garlic and then turn IP off. Add 2 cups of water and rinsed beans to IP and stir. In a separate bowl, combine veg broth, tomato sauce, molasses, brown sugar, mustard, vinegar, pepper, and paprika and whisk until smooth. Pour sauce into beans and mix well. Attach lid, ensuring vent valve is set to SEALING, and then set IP to MANUAL, HIGH PRESSURE, and 45 MINUTES. Once countdown has completed, allow IP to naturally vent for at least 15 minutes, before carefully venting any remaining pressure manually. Careful - the steam is HOT. Remove lid and stir beans. If there is still a lot of liquid, turn IP back on to SAUTE mode and continue cooking until desired consistency is reached. Taste and adjust for any seasonings if needed. You could try dates, or maple syrup. I’ve made this recipe many times. Delicious! So many great recipes on this site. Thank you! I just made these baked beans using pinto beans as that is what I had soaking. They are delicious! As it happens, I watched the American Test Kitchen staff cook baked beans yesterday. They, too, recommended dissolving salt in the soaking water for the beans. They said the beans absorb the brine and then don’t split so much when cooking. Looks delicious! I do not own an IP. Do you have suggestion for stove top cooking? This recipe was too much for the smaller instant pot. Would be nice if there was a warning to make sure you use the big one or half the recipe. spot on perfect! Really great flavors. Great flavor. I thought it was a little too sweet though. After boiling, then soaking the beans for an hour, I made this in a crockpot. Even after cooking all day the beans were still a bit crunchy. The flavor of everything was really good, but I’d like the beans softer. I may have answered my own question. I should have looked at your original recipe that is for a crock pot, and done a double soak, and cooked them before putting in the crock pot.. But that leaves another question. Why can you have everything together in the instant pot and the beans get soft, and not with the slow cooker method? Made this many times since I found the recipe. I am not vegan though I try to eat this way frequently and this is satisfying enough that there is no way I would go back to the traditional recipe. I must say though that I sauteed the onion and green pepper in unrefined coconut oil (1-2 Tbsp) which must add to the smoothness of the sauce. For what it is worth, the last time I made this, I was out of brown sugar and I substituted coconut sugar: it turns out this adds significant depth to both taste and color. Highly recommended! The ingredient list call for tomato paste, but later it says tomato sauce. Which is the correct ingredient? If you don’t have 1 pound of dry beans, how many cans of beans would work for this recipe? The time to cook would be way shorter….